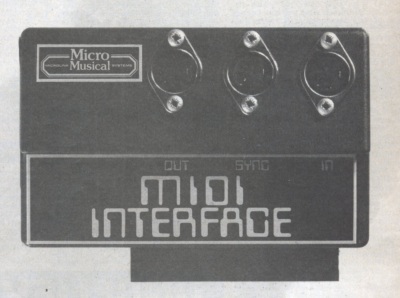 In last month’s NICHE, you were promised a review of selected MIDI interfaces for your Spectrum. We kick off this month, with a package from Micro Musical of Coventry who have come up with a MIDI hardware and a software add-on for Romantic Robot’s excellent Music Typewriter program. We reviewed Music Typewriter in the May issue, where it was judged to be a program of worth, providing excellent graphics, and musical facilities including screen print out and memory space in which tunes may be stored. The editing facilities are simple and easy to use, and the only thing it lacked when we reviewed it was the ability to communicate with musical instruments. Now Micro Musical have come to the rescue. The addition of their MIDI interface and software allows tunes composed on Music Typewriter and saved to tape to be played on MIDI equipped synthesizers. All in all, a pretty logical package. Once a tune has been created and saved to tape with Music Typewriter, the MIDI hardware can be connected to the Spectrum and Micro Musical’s MIDI Musician software loaded. This provides further editing facilities and allows you to control external instruments via MIDI. Like Music Typewriter, it will only store monophonic tunes (ie single note sequences — no chords) up to 254 notes long. This means that it will only run in MIDI’s Omni Mode, as it only gives note information and no voice information. Because the package is designed to control any MIDI equipment, it has cut short on some of the possibilities that MIDI has to offer. Given more powerful software, perhaps, other MIDI facilities could have been included, especially the ability to change sounds within the music you’ve written — but you can’t have everything, can you? The guts of the package is the interface which allows you to plug in MIDI synths, and also non-MIDI equipment such as drum machines. Any tune written into the Spectrum can be performed on a MIDI synth, via the interface. The timing can either be run from the Spectrum itself, the synthesizer/single keyboard or a MIDI drum machine. You can also add drum machines and certain non-MIDI equipment via the ‘sync’ input on the interface to create an impressive array of sound. The editing facilities are thoughtful and comprehensive. High, medium and low registers on the synth can be selected, which in many cases allow you to play notes that the synth keyboard cannot reach. It will also allow you to change your masterpiece into any key. I was a mite niggled however, that the stated key of the demo tune was inaccurate. Minor faults apart, I particularly liked the inclusion of MIDI leads and the microdrive converter programs to the package which allow you to put both Music Typewriter and MIDI Musician onto Microdrive cartridge. A rare touch, nowadays! The package includes everything you need to load up and go... Generally, Micro Musician’s software and hardware is a fine addition to an already proven music program. In combination they give an excellent introduction to music and MIDI control. Micro Musical promise that more software is on the way for their interface, which will add extra facilities to Micro Musician’s repertoire — having lashed out your cash on the initial hardware, there will be more software available to run on it. I don’t think that Micro Musical are under any illusions that this system will be bought by professional musicians, who would be willing to lay out perhaps ten times as much for a dedicated system. For those of us with slightly less to spend, their package represents quite good value. For a little under £100 you get the hardware, and software to drive it including Romantic Robot’s Music Typewriter and Microdriver. 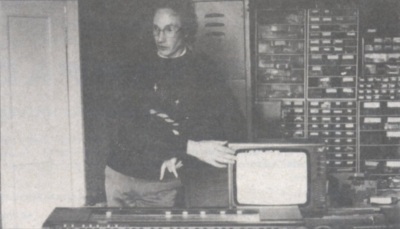 David Thompson, the man who wrote the controlling software for Micro Musical’s MIDI Interface package stands behind a tableful of gear under the control of a humble Spectrum in MM’s music lab.